Do you solve problems in the style of a coyote, competitor or eagle? Recognising the way you approach and deal with problems at work will enable you to identify the most suitable technique to use on a daily basis. Victor Newman’s practical book strikes at the heart of fundamental challenges faced by all managers. It looks beyond the conventional techniques of problem-solving to the underlying process, identifies eight stages and explains how to recognise which technique is appropriate to which stage. On this basis managers can generate solutions at both the personal and the organisational level. 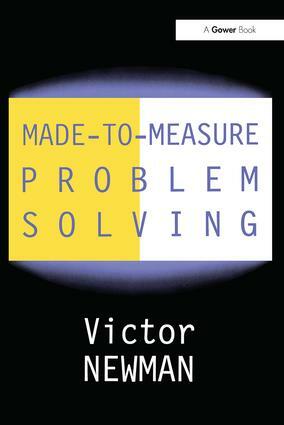 A unique feature of the book is a Problem Solving Styles Profile that enables each reader to apply the material in the text to improve their own problem-solving capability. Contents: Part I How to Use This Book: Your problem-solving styles profile; The problem-solving process wheel; Problem-solving styles. Part II An Introduction to Problem-Solving: Thinking about problem-solving; A question of creativity. Part III The Problem-Solving Process: Stage 1 Identify the problem; Stage 2 Gather data; Stage 3 Analyse data; Stage 4 Generate solutions; Stage 5 Select the solution; Stage 6 Plan the implementation; Stage 7 Test/rehearse; Stage 8 Action. Part IV Some Conclusions: Conclusions; Recommended reading; Index. Victor Newman is Senior Lecturer and Head of Organizational Development Consulting at the CIM Institute, Cranfield University. He developed the Creating Effective Solutions workshop programme for Coopers and Lybrand and has written widely on change management, teamworking and business transformation.